Copyright: © 2015 Avina Fierro JA. This is an open-access article distributed under the terms of the Creative Commons Attribution License, which permits unrestricted use, distribution, and reproduction in any medium, provided the original author and source are credited. Bagatelle Cassidy syndrome is a very rare disease first described in 1995 in a boy with macrocephaly, hypertelorism, hearing loss, developmental delay and facial dysmorphism. The cause of this syndrome is unknown and has no specific diagnostic test. We report the case of a 9-year-old girl with a cerebro-fronto-facial malformation syndrome with macrocephaly, with significant decrease of the hearing, moderate hearing loss (50 db HL at 4000 Hz); mild mental retardation (IQ 50) and noticeable speech delay, psychomotor and developmental delay. Facial anomalies show prominent forehead (frontal bossing) , hypertelorism, downslanting palpebral fissures, flat nasal bridge, short nose with anteverted nostrils; broad columella, long smooth philtrum and carp-like mouth; this phenotype represents the specific dysmorphism of the disease. Our patient is the second case of the Bagatelle Cassidy syndrome described in the literature, confirming the aspects of the previous clinical delineation. Bagatelle Cassidy syndrome is a very rare disease, first described in 1995 by pediatric Rochelle Bagatelle from Tucson University (Arizona) and Suzanne Biesecker Cassidy geneticist from Cleveland University (Ohio) in a boy with craniofacial and dysmorphic features like macrocephaly, and hypertelorism, in a patient with hearing loss and developmental delay ; the cytogenetic analysis showed normal karyotype. It was registered like a new syndrome at National Library of Medicine in year 2010, like MeSH: C537796 . It is an extremely rare cerebro-fronto-facial syndrome characterized by macrocephaly, hearing loss, short stature, mental retardation and developmental delay. The craniofacial anomalies give a distinct appearance by the presence of hypertelorism, downslanting palpebral fissures, flat and broad nasal bridge, anteverted nostrils. The cerebro-fronto-facial syndrome is a type of clinically heterogeneous condition with distinct facial dysmorphism, and brain abnormalities . The most striking feature in Bagatelle Cassidy syndrome is the presence of macrocephaly and deafness. Macrocephaly is defined as head circumference two standard deviation larger than the mean of age, and in the syndrome the macrocephaly is characteristically megalencephaly without hydrocephalus. The deafness type is a sensorioneural hearing loss due to problems of the ear nerve endings, the nerve fibers in the cochlea or caused by damage to the nerve that carries the signals from the inner ear to the brain. 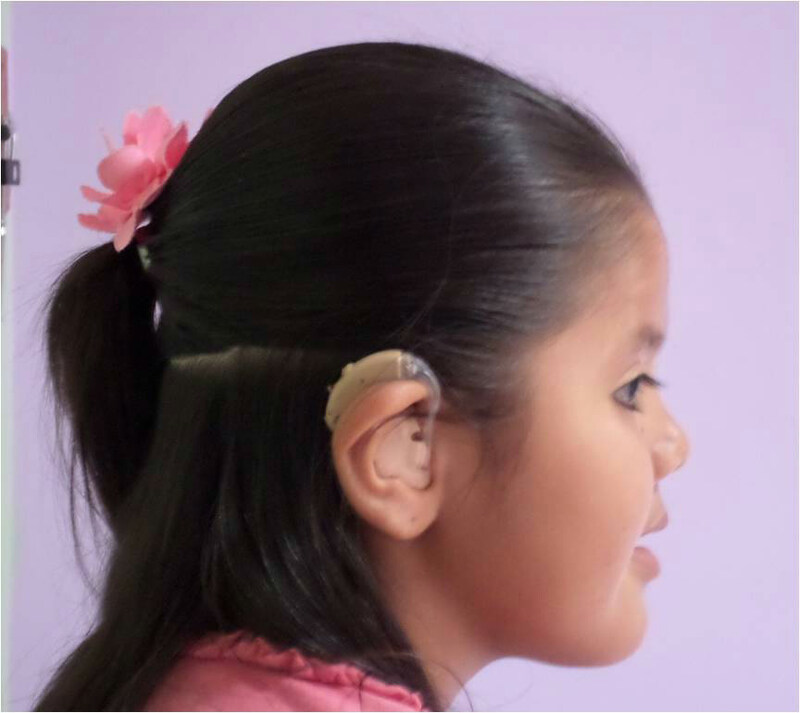 We report a 9-year-old girl with macrocephaly and bilateral moderate neurosensorial deafness. The family history was unremarkable. First gestation full-term, 38 weeks gestation pregnant, baby born obtained in normal childbirth without complications. Non- consanguineous marriage, the father 22-year-old, working like shop clerk; mother 20-year- old, housewife; both healthy. The mother reported no exposure to teratogen and no alcohol during the pregnancy. The birth weight was 2,600 g (7th percentile), length 46 cm (7th percentile), and head circumference 35 cm (75th percentile); based in the chart of National Center for Health Statistics percentiles ; Apgar scores was 7, 9. The patient had moderate delay in psychomotor development, including speech delay; her early motor development was significant delayed, she rolled over at age 5 months, head control at 8 months, sat it at the age of 10 months, stood momentarily without support at 18 months, and walk unsupported at the age 20 months. The speech development was delayed with first words aged 10 months when she said words like "mama" and "dada"; at age 19 months she had several single words, and by age 2-year-old she occasionally put 2 words together. During the first two years of her life, parents noticed increase in the size of the head with frontal bossing. By age 3 years she was toilet trained. At 4 years old, the patient was evaluated by enlarged head circumference, showing no only macrocephalus (large head) but megalencephaly (enlarged brain) but without hydrocephalus; based on the clinical and radiographic findings, she was wrongly diagnosed like Sotos syndrome. The McCarthy Scales of Children's Abilities (MSCA) was used to evaluate the general intelligence level with results of mild mental retardation (IQ 50); and the Test of Early Language Development (TELD-3) to assessment the speech, scoring a moderate spoken language delay. 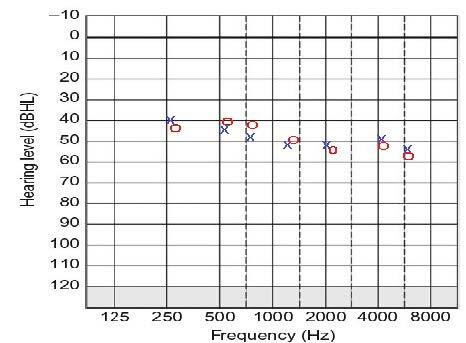 At age 8-year-old, a new hearing evaluation was done because of poor response to noise, the audiogram showed 50 db HL at 4000 Hz (Figure 1), and the brainstem auditory evoked response test reveals bilateral moderate neurosensorial hearing loss that was improved with hearing aids, but it has been static. The patient has one normal brother 2-year- old without anomalies, developmental delay, or hearing problems; no one in the family is reported to have any findings similar to those of the patient. The karyotype at the 500 bands was normal with no anomalies in chromosomes; the Fluorescence in situ hybridization (FISH) showed no abnormalities: microdeletions or microduplications. 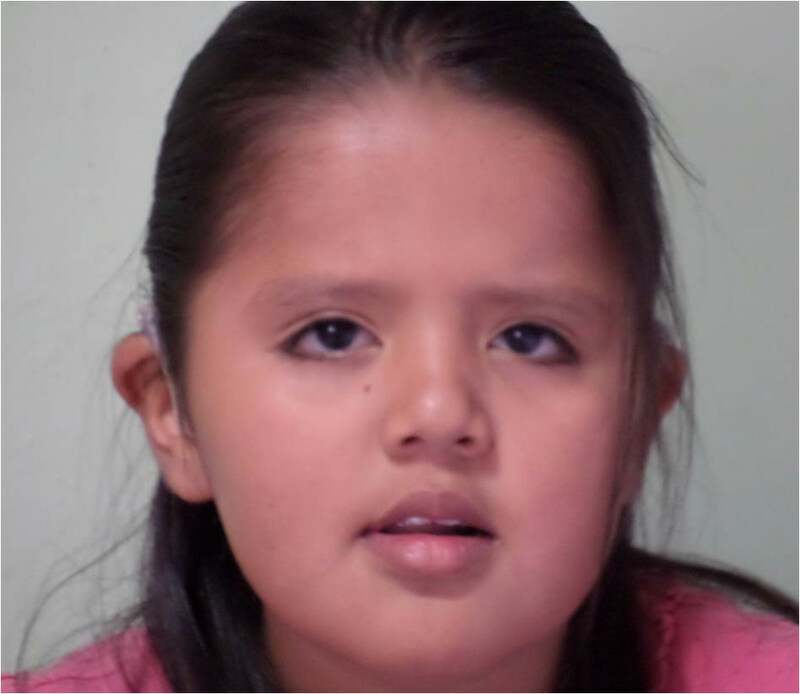 We present a girl with fronto-facial dysmorphism who has mild intellectual disability but she is very social and interactive, she is in the second grade of special school for handicapped children. The physical examination revealed low stature, her height is 126 cm (12th percentile), the weight 26 kg (27th percentile) but the patient has a big head with increased circumference of 55 cm (98th percentile). The dysmorphologic evaluation using the Elements of Morphology  revealed her craniofacial anomalies: an overly large head with round face, frontal bossing with prominent, downslanting palpebral fissures, sparse eyebrows, wide flat nasal bridge and increased distance between the eyes (hypertelorism), broad columella, nose with anteverted nares, long smooth philtrum; wide carp-like mouth. With prominent full lips (Figure 2), large cupped low-set ears, thickened and overturned helix (Figure 3). She has a slightly less measure of arms span 123 cm, with a difference of arm span/stature of only 3 cm decreased; the rest of clinical examination was otherwise unremarkable. The patient has a normal development of the teeth, in the present day. The proband is a female and the first child of healthy nonconsanguineous parents with normal family history. This syndrome is assumed to have a genetic etiology, although this has not yet been identified. Our case may be caused by a sporadic genetic mutation that occurs for the first time in a family like a genetic disease not inherited from the parents, but arises via a new spontaneous change. The craneofacial dysmorphic findings have similar characteristics to previous described syndromes by Der Kaloustian  and another fronto-facial case by Forzano ; and had some features from other clinical deformities diseases reported by Mégabarné [8,9] of facial anomalies, deafness, short stature and moderate mental retardation. We propose five major criteria for the diagnosis of the Bagatelle Cassidy syndrome: macrocephaly, hearing loss, short stature, developmental delay and mental retardation (Table 1); all of them are important disorders that affect the functions of organs and systems of the body, requiring external intervention and treatments. The craniofacial anomalies were considered like minor criteria: frontal prominent, hypertelorism, downslanting palpebral fissures, flat nasal bridge, short nose, anteverted nostrils, broad columella, long and smooth philtrum and carp-like mouth (Table 2); these are deformities in the growth of the head and facial bones, birth defects that can be variants of the normal anatomy and have little clinical significance, but the presence of these anomalies can help in diagnosis of the syndrome. The assessment of psychomotor development of this girl was based on her motor and social developmental milestones, and the estimate of her mental status and cognitive function was based on the level of school and social performances and shows developmental delay and mild mental retardation with speech delay; other feature included was speech delay. This case shows that the syndrome may affect both sexes: the first patient reported was a male and this new one is a female, the both affected patients showing the same facial characteristics of the phenotype. Our patient is the second case of the Bagatelle Cassidy syndrome described in the literature and shares all the clinical similarities with the previous reported case, confirming the clinical aspects of the syndrome. We suggest that the recognition of characteristic craniofacial features may therefore assist in the clinical diagnosis of Bagatelle Cassidy syndrome at an earlier age of patients. Further observations will be required to determine the complete delineation of this syndrome. 1Bagatelle R, Cassidy SB (1995) New syndrome of macrocephaly, hypertelorism, short limbs, hearing loss, and developmental delay. Am J Med Genet 55: 367-71. 2 Medical Subject Headings. 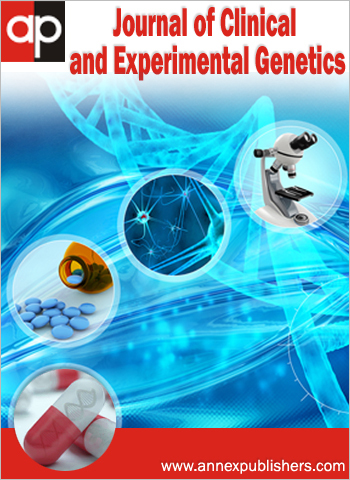 Web Bioportal (2015) Date accessed: 22 Sept 2015. 3 Winter RM (2001) Cerebro-fronto-facial syndrome: three types? Clin Dysmorphol 10: 79-80. 4 Hamill PV, Drizd TA, Johnson CL, Reed RB, Roche AF, et al. (1979) Physical growth: National Center for Health Statistics percentiles. Am J Clin Nutr 32: 607-29. 5 Allanson JE, Cunniff C, Hoyme HE, McGaughran J, Muenke M, et al. (2009) Elements of morphology: standard terminology for the head and face. Am J Med Genet A: 6-28. 6 Der Kaloustian VM, Pelletier M, Costa T, Blackston DR, Oudjhane K (2001) A new syndrome with craniofacial and skeletal dysmorphisms and developmental delay. Clin Dysmorphol 10: 87-93. 7Forzano F, Faravelli F, Di Rocco M (2004) Cerebro-fronto-facial syndrome: report of a further case. Clin Dysmorphol 13: 121-2. 8 Mégarbané A, Bejjani BA, Shaffer LG, Jambart S, Souraty N, et al. (2002) Craniofacial anomalies, deafness, brachydactyly, short stature, and moderate mental retardation due to a cryptic 6p;11q translocation. Am J Med Genet A 108: 69-74. 9 Mégarbané A, Rassi S, Estephan F, Kouba-Hreich E (2004) Post-natal short stature, short limbs, brachydactyly, facial abnormalities, and delayed bone age: a new syndrome? Am J Med Genet A 125: 57-60.